The vending machine at Hodes seems to be in a randy mood this week. 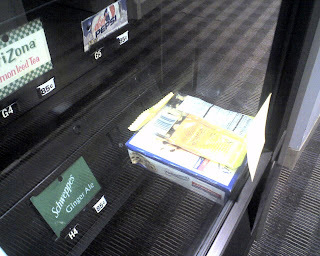 I walked by it and saw a box of Entemann’s mini chocolate cookies stuck right above the recieving compartment. Apparently it had fallen from the top shelf and landing perfectly square and wedging itself against the corner of the machine. What’s funnier is that I came back later and saw a pack of mixed nuts on top of the cookie box. It was the classic conundrum of The Lady or the Tiger. 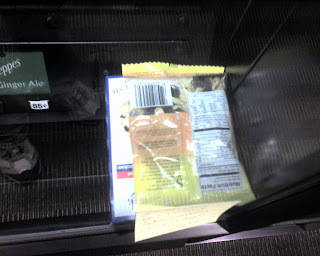 Do I choose a snack on the far side, knowing it will escape the snack trap in the other corner, or do I do something good for my fellow coworkers and try to dislodge the snacks by getting something heavier to fall on top of it? So, I put in my 85cents and chose G5, hoping my can of diet pepsi would fall on top of the snacks. It popped out and landed on top of the pile, but no dice. I had failed, becoming yet another victim of the Vending machine. Of course, I wasn’t about to shame myself further by putting up a sticky note with my name and phone extension on it asking the vending machine owner to kindly remit my snack or my 85cents. Sometimes in life, you just simply have to walk away and leave your ego behind. And that’s what I did.